Exotic Blackwood Gloss Chess Board - Great Gift Idea! The board is a House of Staunton Black Gloss wooden Chessboard. 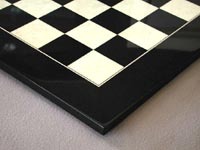 This veneered chessboard is 13mm thick and features a rich gloss finish. Constituted of Blackwood(dark) and Bird's Eye Maple(light) squares, with a Blackwood frame.